Wood-Fired Pizza is a completely different experience than any other kind of pizza. Most pizza is bready, heavy, over-sauced with too many toppings on a factory produced dough. These pizzas have to be made this way to create flavor to make up for the fact that their ingredients are nowhere near fresh. The foundation of every pizza is the crust. Chain-store pizza crusts often have more than 30 ingredients that include preservatives, additives, and artificial flavors. 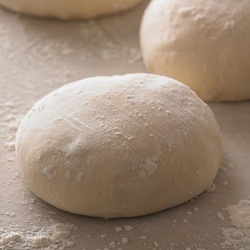 Our crust is made fresh in small batches right here in Gillette by our own artisans with no more than 5 ingredients, (North Dakota grown flour, spring water, olive oil, sea salt, and yeast.) We hand toss our crusts because when dough is rolled or pressed much of the wonderful yeasty flavor is lost, when it is stretched by centrifugal force, the yeasty air pockets are stretched rather then broken which gives our dough tons of air and complex character. Our sauce is ultra-simple and ultra-fresh with only Fire-Roasted Organic tomatoes, because of that, we don't add sugar or sweeteners, or spices. The other guys add those things to make up for their lack of fresh tomato flavor. Do you ever get heartburn from pizza with red sauce? According to PMQ Magazine, red sauce can cause heartburn for a lot of people because too many dried herbs have been added to the sauce which when paired with acidic tomatoes, agitates the digestive system. We avoid that completely by keeping it real. Fresh Organic herbs are added to our pizzas after they have been cooked for a taste that can't be beat. We don't over top our pizza, this way you will be able to enjoy the individual flavors of the fresh toppings. This also allows our pizza to cook extremely fast at very high temperatures which brings out even more dynamic flavors with hints of oaky smoke. In fact, our pizzas cook directly on the oven floor in less than two minutes! Even chain stores can't cook factory-food that fast!